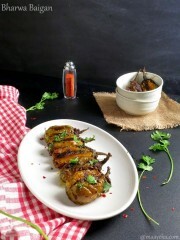 Bharwa Baigan Sabzi- During summers we often make stuffed vegetables which easily stays well for 2-3 days ,though we can make many variety of stuffed vegetables but baby brinjals are so popular that we have numerous variation of making them,every region have there own favorite way of making them. 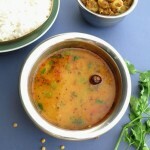 In southern part of India ,tamarind and coconut is used to make bhawa baigan and in Maharashtra and Gujarat they use peanuts,gram flour for stuffing. But in Uttar pradesh we rarely use coconut and tamarind.Though there are few popular variation of making bharwa baigan in Uttar pradesh according to individual taste and choice, but this simple and delicious version of bharwa baigan is the most popular as only dry spices are used to make this so its quick and have a long shelf life so great to make in summers and also a good travel food. 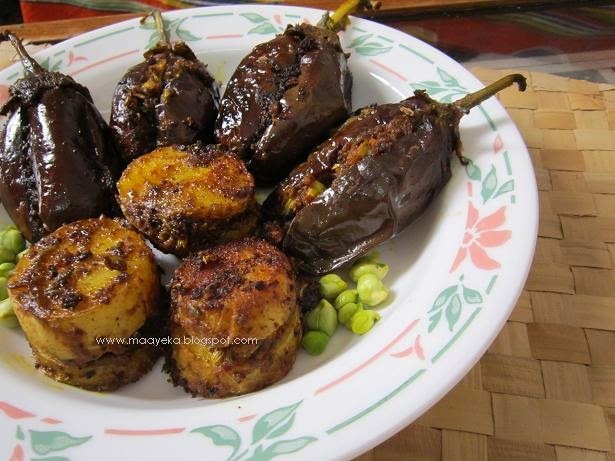 You can make so many recipes with brinjal. 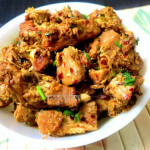 In Northern India the most popular one is Baigan ka Bharta. In my family Sem Baigan, U.P Style Bharwa Baigan, Choliya aur Baigan ki sabzi, Aloo Baigan ki sabzi are made regularly and everyone enjoyed these preparations. These Bharwa baigan are specially made in winters when fresh green gram is easily available in the market. But you can make it with out the green gram or use fresh peas instead of gram. It taste awesome both ways. Wash and slit the brinjals. Slice potatoes in thick roundels and then make a slit in the centre . Take a bowl and mix all the spices, gram flour, fresh green gram and oil. Stuff this mixture in the brinjals and potatoes. Gently press and seal the mixture by pressing it with your thumb. Heat 5 tbls of oil in a pan, add asafoetida, and then put potatoes and brinjals, mix gently and then cover and cook on slow flame . Keep turning the sides after every 2 minutes. It will take approx.10 minutes to cook . Sprinkle some chopped coriander when done. 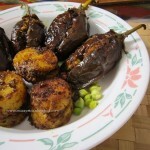 Serving suggestions-serve as a side dish with meals or use as a travel food. This dish stays fresh for about 4 days at room temperature, during winters. 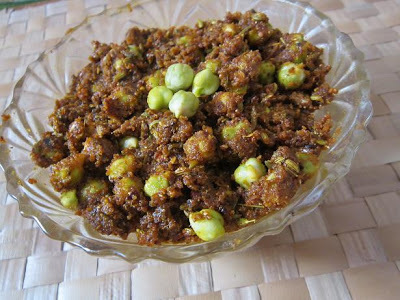 Variation-can substitute green gram with fresh green peas or fresh lilva or tuvar or without adding any of these,just stuff with the masala. My God,that's such a delightful stuffing Mayeka…I completely gone for it.Slurp ! Stays fresh for four days without refrigeration! Wow! What a treasure we have in our traditional recipes. Thank you so much for this unusual recipe. Can we make it with green peas, because I am in Saudi and I dont think green gram will be available here? 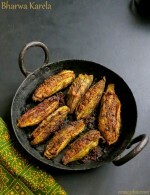 Stuffed brinjal looks awesome! 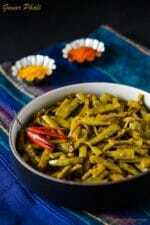 Never tried it with fresh green gram, A good one to try ! simply superb…i'm drooling over here…. Yummy n perfect side with Indian Staples! Love the rustic filling, I'm very sure this will taste awesome. sadly, I do not get fresh chana here. Very delicious recipe, that's a nice different stuffing..